So, the contradiction, red versus green, eventually came to mind. Obviously, if you were using a night vision device, you don’t want to be night blind for ten minutes each time you switch from amplified vision to normal vision. Night vision devices portray an artificial representation of low light, the ocular section of eyepiece is small television screen that displays the amplified light. The engineers choose green imaging instead of red. Stupid scientists! Didn’t they see “Ice Station Zebra”? Everybody knows that red filters are to protect your night vision! I hate to admit it, but it turns out that my popular conception was a popular misconception. It seems that, behind my back, the engineers and scientists studied this stuff, came to science based conclusions, and implemented solutions without telling me (a common occurrence I understand). I don’t want to go into a lot of detail on the anatomy of the eye, but let me refresh your high school biology class, the one you may have slept through. The human eye has two types of receptors, rods and cones. Rods are only sensitive to light and basically give you vision in low light conditions (scotopic) with no color values (call it grey-scale). 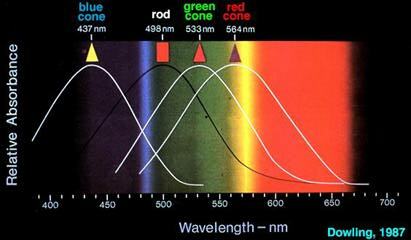 Cones give you color if lighting conditions are strong (photopic), but they are specialized. Each cone can sense only one color: red, green, and blue (to geek tweak this a bit, the red cones include red, but are more in the red-green border). of sensitivity of the eye’s cones. 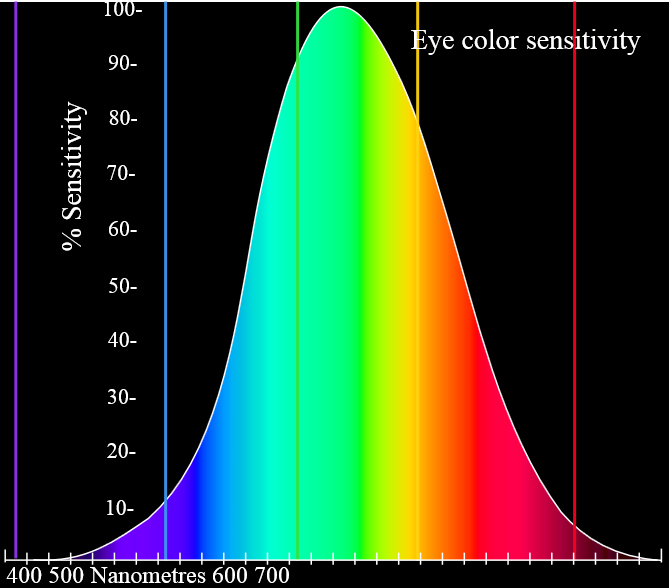 As seen in the first graph, the eye is actually more sensitive to the green light range than in any other color. The eye can perceive more with less stimulation. In the second graph, there is more overlap between the rods (giving grey scale) and the green cone range. My supposition here is that the rods will reinforce the green range information that the brain can use for additional data in shading the color we perceive as green. The night vision ocular screens on night vision devices are designed to optimize the eye’s preferential sensitivity to green and the low light sensitivity of the eye’s rods. If the eye is more sensitive, the device can use less power to display an image. Also, the eye can adjust more quickly to normal night with a lower intensity light source. a spectrum background for reference. But what about protecting my night vision! Are you trying to kill me? Red and green have nothing to do with a person’s night vision. In the case of the night vision goggles, green is the best design color to present information to the eye. An individual’s night vision is dependent on the quality and quantity of the rods on their retinas. Rods work well under low light conditions which is your night vision, a grey-scale. The operational problem is that it takes about 10 minutes for your rods to begin to adjust to dark conditions and about 20 minutes to become fully optimal. Moving in and out of differing levels of light can become a problem. It isn’t the color that is important, it is the intensity of the light. The key to human normal night vision is to protect the retinas (and rods) from strong light. If for some reason it is so important that you be instantly able to function in the dark, wear dark sunglasses 10-20 minutes before you hit the night. But, not while you are driving a car! That would invite all kinds of mayhem. What about red and Ice Station Zebra? Infrared technology has been a competing technology to light amplification in the night vision industry. Simple black and white cameras are night vision capable because they can sense low frequency light into the infrared spectrum. All you needed was an infrared light source (invisible to our eyes) and you could see in the dark. I suggest that the “red” in infrared became synonymous with night vision in this context. Then, “red” became the magic color in the context of human level night vision. The conflation of two different reds and conflation of human normal and technological night vision. I will repeat, the above guess is just that, a guess, but my conclusion is the best I can make. Red has no function. Forget the red. Just enjoy Ice Station Zebra the same way I did (do), as a guilty pleasure. I primarily write about leadership and business topics. My other interest in applying critical thought to the decision process. In my various experiences in leadership training, I have seen many examples of leadership theory and the decision making process. But, nobody discusses the critical thinking and how you scientifically weigh evidence. In my elaborate yet innocuous example, I noticed that there seemed to be a difference between green (stupid scientists!) and red (the natural protector of night vision). I was wrong about everything. I am no expert on the human eye, but I can research. I can evaluate and validate information from reliable sources. Everyone can. Don’t let science and technology intimidate you. Yes, it can be hard to understand, but your goal should be to understand general concepts and their interrelationships. Nobody will ask you to do the math. As I parsed out the information – I researched the information – I found that my premises were wrong, my logic disconnected, and my terms were out of context. 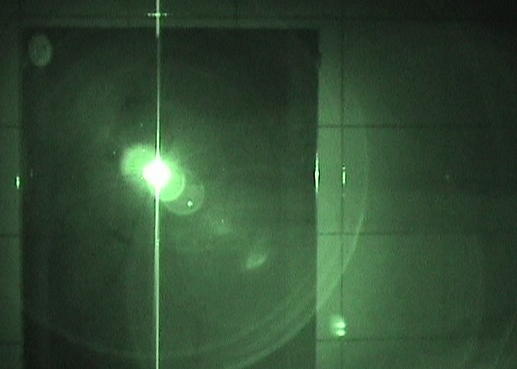 The green was a design feature of night vision “technology” to optimize a feature of the eye. Eyes are more sensitive to green. Red had nothing to do with human level night vision (let’s define night vision as the natural ability to see in low light conditions). If you want to quickly adapt to low light, limit the light that hits your retinas. By applying these steps every day to the little things in life you create a habit of critical thinking, a habit of thinking for yourself. You can apply these steps to the little and big things in life.